Have you ever planned a photography trip then looked at the weather then canceled the trip? Well none of us enjoy shooting in foul weather, but you may want to reconsider. I don’t know how many times I have hit my front door at four AM to find miserable slush or pounding rain on my front step and had the overwhelming urge to go back to bed, but over the years I have found that some of my best photos were born in inclement weather situations. I have made a vow to myself to never go back to bed despite the overwhelming urge. 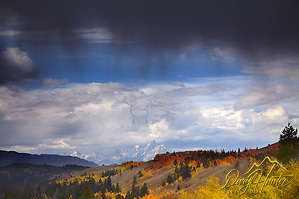 Around Yellowstone, we get a plethora of foul weather and I love to photograph while the sky is leaking or threatening to. Inclement weather often times is a photographer’s gift from above. Summer’s thunderstorms grace our skies with dynamic texture that removes the monotony of a clear blue sky. When lucky enough to have morning or evening thunderstorms, the clouds act as a projection screen for gathering the warm light of the magic hour to enhance the landscape below. Winter offers a beauty that is at once spare, but stunning, when the thermometer reaches twenty below the atmospheric reaction to the cold is well worth recording. The air gets so crisp, the frost is so shiny; the ice fog creates a mysterious landscape on the valley floors. A landscape covered with a fresh blanket of snow is always a treat. 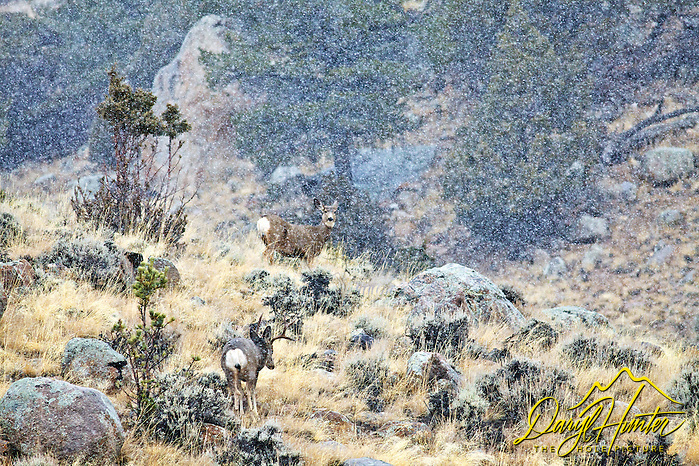 Those of us that brave the elements are rewarded with dramatic skies that enhance our subjects, snowflakes that add punch to our wildlife photos and overcast skies that remove harsh shadows improving the saturation of our photos. I love how the big fat snowflakes of fall and early winter photograph juxtapose against the browns and tans of the lifeless foliage of the autumn landscape. I am drawn to the drama of thunderstorms dumping huge amounts of rain on the distant landscape. Photographs of heavy snow dumping on wildlife evokes empathy and awe from the viewer and engages them more in the photo. Today’s digital cameras allow us to get excellent results that we could achieve back in the days of old – the film days. With film I rarely shot above ISO 100, as whenever I ventured to ISO 200 I hated the results. This aversion to high ISO’s ruined many photo opportunities in my early days of digital shooting, as I was afraid to venture there beyond ISO 200. Today, I am comfortable with ISO’s of 1,250 when needed which opens up photo opportunities that weren’t available during our previous century when I first learned to shoot. Each generation of DSLR’s expands the upper ISO quality. I know many photographers who won’t shoot on a bluebird day. Foul weather presents a perfect recipe for dramatic photography, bluebird days are beautiful for recreating but they rarely provide dramatic photographs. Often, the charm of inclement weather eludes us because of our aversion to discomfort, howling winds, pelting freezing rain, hail, finger-numbing temperatures certainly are a discouragement to many but that just weeds out those who are willing to ignore the extraordinary. Posted on Thursday, March 22nd, 2012 at 11:49 am. Filed under: Photography, Photograpy Tags: diffused lighting, how, inclement weather, landscape photography, overcast, photography, rain, snow, Southwest, weather conditions, weather photographic challenges, why, Yellowstone	RSS 2.0 feed.